Today, I am glad to welcome a special guest on our blog: the mum behind the instagram account @raising_arabic_stars. “When my daughter didn’t get her nursery place right away at our local setting, I realized I needed to cover the early years curriculum myself. As I started, it became apparent she knew most of it already in English so I started it in Arabic. I think that is when we started following @arabicseeds on Instagram and would enjoy watching her videos teaching her daughter. So we crafted and painted and sang and played and focused on as much Arabic vocabulary as we could. We made mistakes, corrected them and shared our journey learning a new language. I was then added to a few Home-schooling WhatsApp groups by a friend as I decided to home-school my daughter once she completes her time at nursery. In this group I came across a post where an Arabic teacher was sharing her tuition details and prices. It was at this moment I thought I could start my own play group in my home I just needed a facilitator who spoke Arabic. Primarily to create an environment where children are exposed to the Arabic language but also where Home-schooling mothers could build a community. I put the advert out on the WhatsApp group, reeled family members with young children in, found the friendliest teacher through a close friend and prepared for a trial session. I kept the cost as minimal as possible to cover the cost of the teacher for the 1 hour and was happy to plan and prepare the resources for the session myself. The trial was chaotic and full of energy but overall a lovely environment for mothers and children. There was mixed feedback from mothers, and lots of pointers to build on but the decider for mothers to return was either hearing their child hum the Arabic rhymes or use some of the vocabulary learnt at the playgroup. We have been running for 10 weeks now and only had 1 mother drop out. I’m impressed with the commitment from mothers especially as some travel quite a distance. I split the groups by age and decided to run 2 sessions a week. We are building slowly and mothers are supporting organizing sessions @farahsmendhi when we had our “fruit” session and helping with printing certificates @summaiyahmukadam. We started off with just 2 Arabic rhymes and now we have learnt nearly over 10. Our session starts with children placing their names on a tree. Their names are in Arabic and it’s been inspiring to see that children recognized their name at the second session. I often narrate the following story whereby my daughter was devastated when she started nursery and they wrote her name in English. She demanded they write it in Arabic as that is what we had done. It was a must for me that children can read their names in Arabic. We greet the children asking how they are and about the weather that day. Credit @raising_arabic_stars – What’s in the box? We then warm up by singing “what’s in the box”, in Arabic of course, and as each child opens a glittery decorated shoe box and takes out an object we measure who recollects the name of each object. We move on to our main which ranges from crafts to carousel of play stations to making fruit skewers to biscuit decor. Throughout the main the Teacher is teaching key vocabulary and giving each child 1-1 attention to practice spoken Arabic. Following this, we have story time and singing time all in Arabic. We end the session with a little snack and water for children. There’s scope to do so much more in the future and I hope we can collaborate as mothers to build and develop this playgroup in to an environment where children are exposed to the Arabic language. 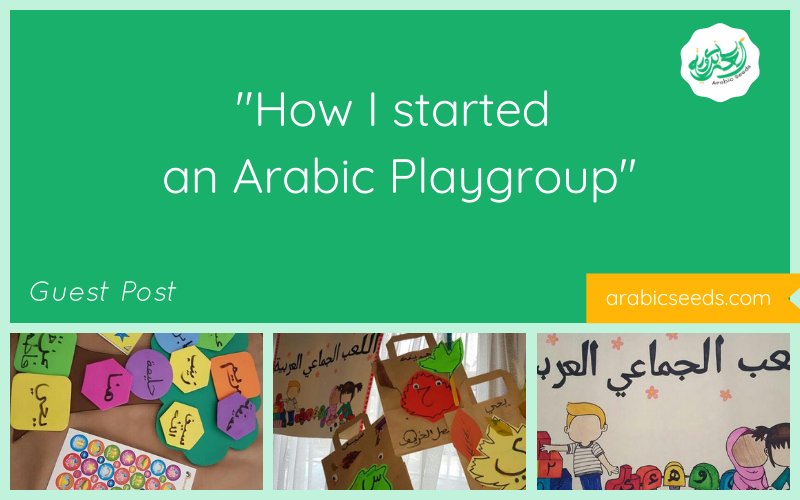 If you are interested in starting/managing an Arabic playgroup and have questions, write a comment below and we will forward it to the mum behind @raising_arabic_stars. You can also get in touch with her through her instagram account @raising_arabic_stars where she share activities from her Arabic playgroup. _ Emilie, cofounder of Arabic Seeds. Salam..I would like to open an Arabic playgroup. But I’m doing it for Malaysian kids..How do I start? Loved ur post. It definitely increased my hope of teaching my daughter and my self Arabic. I would love to follow ur activities and teachings for my daughters and with other kids. Once I get a hang of it In Shaa Allah I can start a group . Thank you for sharing this story. I’m inspired to start an Arabic playgroup too. I have some questions. I will try to get in touch with Arabic seeds. That’s really great that it gives you inspiration! Feel free to email us or use the contact form, we will be glad to answer you.